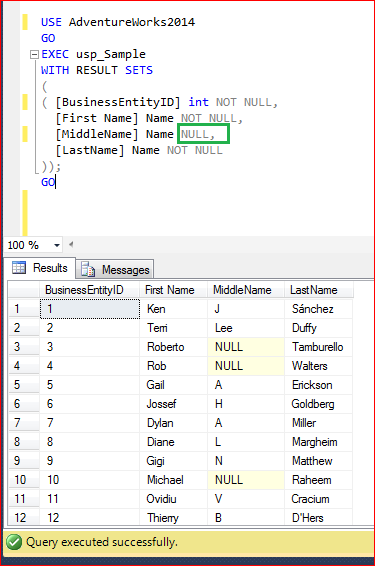 EXECUTE statement failed because its WITH RESULT SETS clause specified a non-nullable type for column #%d in result set #%d, and the corresponding value sent at run time was null is one of the new error messages noticed in SQL Server 2012 and above. This error message is due to the invalid use of new feature EXEC WITH RESULT SETS shipped with SQL Server 2012. Error Message: EXECUTE statement failed because its WITH RESULT SETS clause specified a non-nullable type for column #%d in result set #%d, and the corresponding value sent at run time was null. 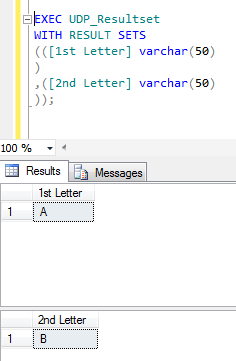 You can see that the above stored procedure is executed successfully and it has ONE result set. EXECUTE statement failed because its WITH RESULT SETS clause specified a non-nullable type for column #3 in result set #1, and the corresponding value sent at run time was null. Why this error ? Because, I specifically mentioned in the RESULT SETS that none of the columns should return NULL and I did not realize that stored procedures return some NULL values in the middle name column and due to this I got this error. So, when you mention any column as a NOT NULL in RESULT SETS, please make sure that the stored procedure must NOT return NULL VALUE for that particular column. Lets re-write the RESULT SET and this time we need to mention, middle name column is NULL as shown below. 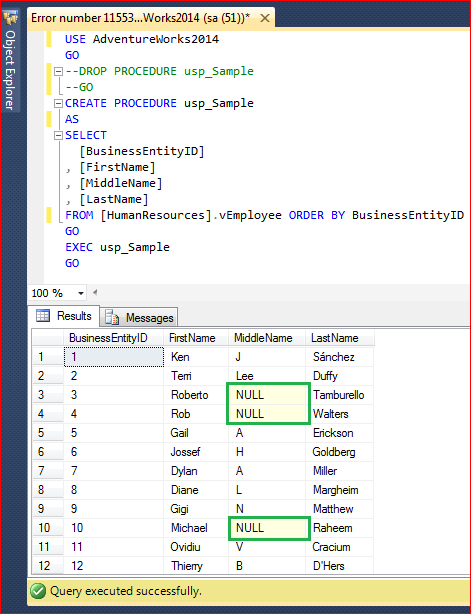 Remember, whenever you use any stored procedure using WITH RESULT SETS clause, along with the nullable type, make sure that the data that comes from stored procedure should match with the nullable type. In other words, if you define any column in RESULT SETS clause as NOT NULL column then make sure that stored procedure MUST NOT return NULL value in that particular column to avoid such errors. 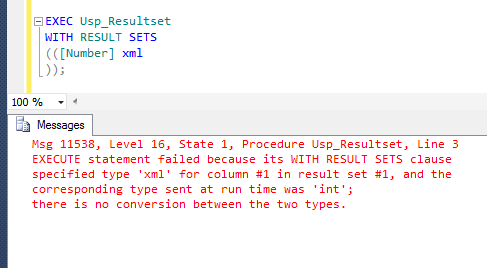 EXECUTE statement failed because its WITH RESULT SETS clause specified type ‘%ls’ for column #%d in result set #%d, and the corresponding type sent at run time was ‘%ls’; there is no conversion between the two types is one of the new error messages seen in SQL Server 2012. This error message is due to the invalid data type usage in the new feature EXEC WITH RESULT SETS. Error Message: EXECUTE statement failed because its WITH RESULT SETS clause specified type ‘%ls’ for column #%d in result set #%d, and the corresponding type sent at run time was ‘%ls’; there is no conversion between the two types. You can see that the above stored procedure is executed successfully and it has ONE result sets with int data type column. EXECUTE statement failed because its WITH RESULT SETS clause specified type ‘xml’ for column #1 in result set #1, and the corresponding type sent at run time was ‘int’; there is no conversion between the two types. Ooops…… I am unable to execute it. It returned the error message. Why this error ? Because, the above stored procedure returns one result sets with int data type column but we defined XML Data type column in WITH RESULT SETS clause. This is true that you can change the data type & column name in result sets, but the issue is, we must look at the data type compatibility as well. And as we know, int & xml data types are not compatible with each other. 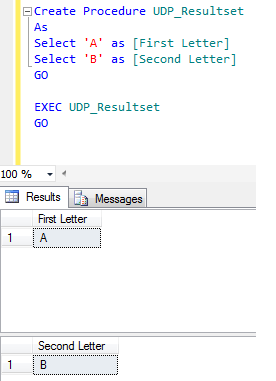 Lets rewrite the script and define int data type column (or any data type that is compatible with int) in the result sets to avoid this error. 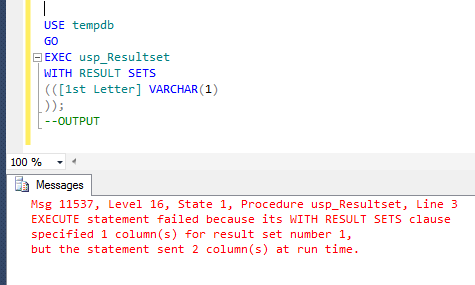 Remember, whenever you use any stored procedure using WITH RESULT SETS clause, make sure you use data type in the result sets that is compatible with the source column data type to avoid such errors discussed above. SQL SERVER – Fix – Error – 11536 – EXECUTE statement failed because its WITH RESULT SETS clause specified result set(s), but the statement only sent result set(s) at run time. 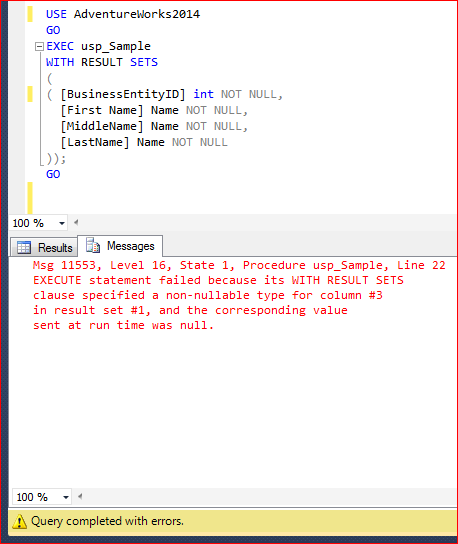 EXECUTE statement failed because its WITH RESULT SETS clause specified %d result set(s), but the statement only sent %d result set(s) at run time is one of the new error messages seen in SQL Server 2012. This error message is due to the invalid use of new feature EXEC WITH RESULT SETS. Error Message: EXECUTE statement failed because its WITH RESULT SETS clause specified %d result set(s), but the statement only sent %d result set(s) at run time. 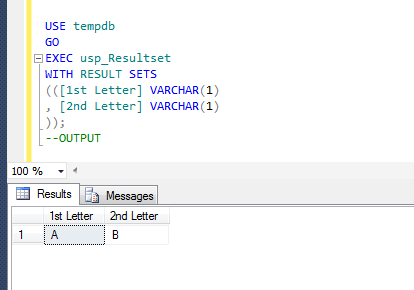 You can see that the above stored procedure is executed successfully and it has two result sets. Lets try to execute it with WITH RESULT SETS clause. EXECUTE statement failed because its WITH RESULT SETS clause specified 3 result set(s), but the statement only sent 2 result set(s) at run time. Ooops…… I am unable to execute it properly. It returned the two result sets and the error message. Why this error ? Because, the above stored procedure returns two result sets but we defined WITH RESULT SETS clause for three result sets. Lets rewrite the script and define two result sets (The same number of result sets returned by stored procedure) to avoid this error. 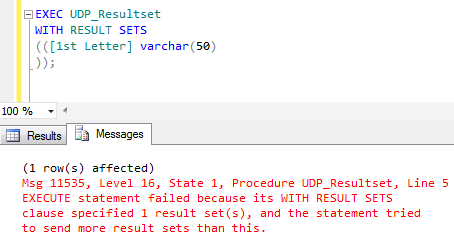 Remember, whenever you use any stored procedure WITH RESULT SETS clause, make sure you use exactly the same number of result set returned by stored procedure to avoid such errors. 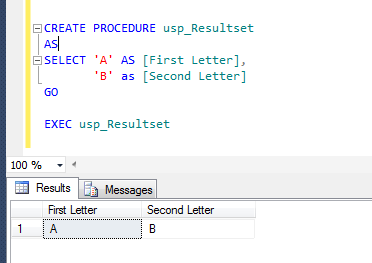 SQL SERVER – EXECUTE statement failed because its WITH RESULT SETS clause specified result set(s), and the statement tried to send more result sets than this. 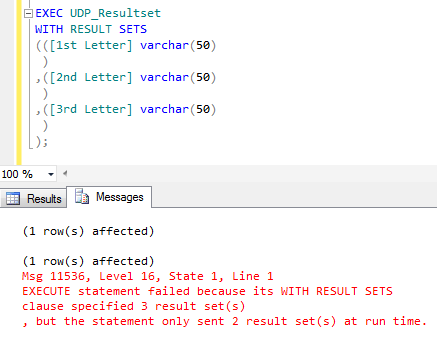 EXECUTE statement failed because its WITH RESULT SETS clause specified %d result set(s), and the statement tried to send more result sets than this is one of the new error messages introduced in SQL Server 2012. This error message is due to the invalid use of new feature EXEC WITH RESULT SETS. 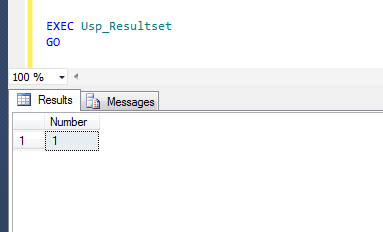 Error Message: EXECUTE statement failed because its WITH RESULT SETS clause specified %d result set(s), and the statement tried to send more result sets than this. 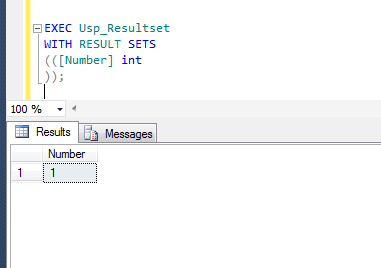 You can view that the above stored procedure is executed successfully, and it has two result sets. to send more result sets than this. Ooopps…… I am unable to execute it properly. It returned the first result set and the error message. Why this error ? Because, the above stored procedure returns two result sets but we defined WITH RESULT SETS clause for only one result set. Lets rewrite the script and define two result sets (The same number of result sets returned by stored procedure) to avoid this error.